Creative Ideas for Science Fair Projects -- Mushrooms!! Working with mushrooms has endless possibilities. There are many types of mushrooms available and they are easy to grow. 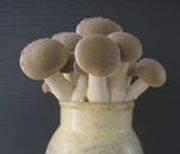 Mushroom kits are widely available. A mushroom is the fruit (like an apple) of the mushroom "plant" and contain mushroom "seeds" called spores. Mushrooms are fungi, and are usually placed in a Kingdom of there own apart from plants and animals. Mushrooms have no chlorophyll and most are considered saprophytes. That means they obtain their nutrition from metabolizing non living organic matter. Mushrooms break down and "eat" dead plants. The body of the mushroom stores nutrients and other essential compounds, and when enough material is stored and the conditions are right they start to fruit or produce mushrooms. Mushrooms love moisture and the outdoors. Some mushrooms can onlly be grown outdoors. What is the effect of different water pH? What is the effect of plant hormones? Mushrooms produce spores instead of seed. The spores can be counted with a microscope. See if you can incorporate this into your project. What is the effect of temperature on mushroom growth? What is the effect of different types of light e.g., natural, fluorescent, tungsten, colored, polarized etc. Mushrooms live off of dead plants. Is there a difference in growth depending upon what type of plant is used as fertilizer?